When I was 10 years old my dad started a cement curbing business that required all of his boys to involuntarily join the family business. The creation of this business required the purchase of an old truck to pull the trailer that my dad had personally built and retrofit to haul one ton of sand, a cement mixer (mounted to the back of the trailer), and 80-100 bags of concrete. Once loaded, we would then place the other small machinery, wheel barrels, shovels, etc, onto the trailer. Each day four or five of us would pile into the truck and we would head off down the road in search of new sand and concrete in route to our jobs. Needless to say, we were unknowingly loading our truck and trailer improperly. As I look back now, I can recall several, and I mean several, precarious situations that we were in as we worked our tails off to provide for our family. Those were hard fought, great days. Our family was no different than thousands of Americans hustling every day to provide for their families in a very similar way. What Is Gross Combined Weight Rating? 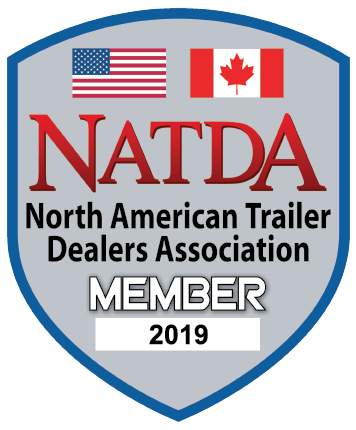 In previous blog posts, we have discussed the importance of knowing your gross vehicle weight rating (GVWR) and gross trailer weight (GTW). What happens when you add these two weights together? 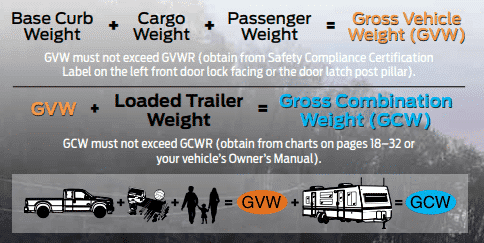 Gross combined weight rating or GCWR is the maximum allowable weight of both the loaded tow vehicle and the loaded trailer that the tow vehicle can handle safely. This maximum combined weight rating is determined by the manufacturer and can be found on your vehicle’s placard. Most of us don’t even know that this weight rating exists or that it should be measured appropriately before towing. According to Ford’s RV and Trailer Towing Guide, the gross combined weight can be found by adding the gross vehicle weight (GVW) with the gross trailer weight (GTW)/loaded trailer weight. It is important to remember that the gross vehicle weight is the base curb weight of the vehicle (weight of the vehicle including a full tank of fuel and all standard equipment, not passengers) plus the cargo weight (all weight added to the base curb weight including cargo, optional equipment, and trailer tongue weight) plus the passenger weight. The gross trailer weight is the weight of the empty trailer combined with the weight of anything you put on or inside of the trailer. Below is a visual illustration from Ford’s Towing Guide. 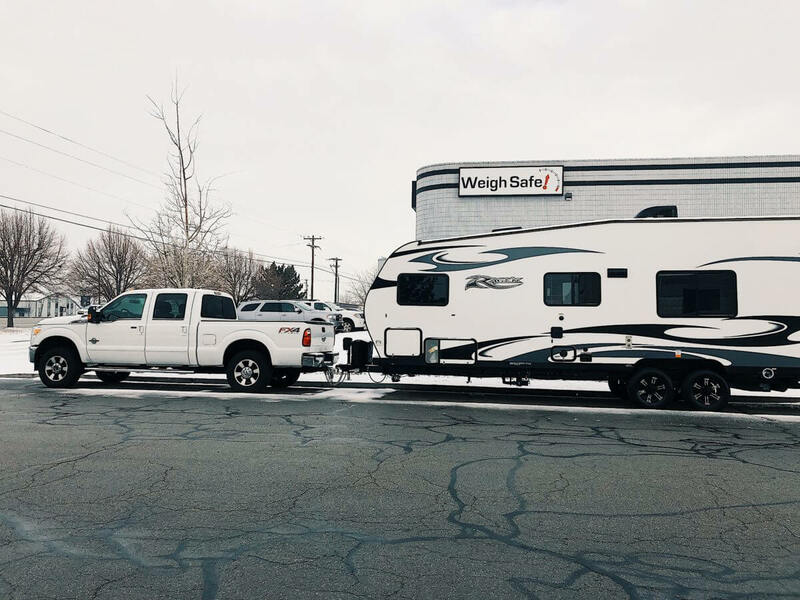 You can determine your gross combined weight by finding a public scale in your area and pulling your fully loaded tow vehicle and trailer onto the scale. This is a time consuming task, but one that you will not regret. The gross combined weight of the tow vehicle and trailer must never exceed the GCWR. When you choose to overload and exceed the GCWR, you are at risk of damaging both the tow vehicle and trailer, and you put your safety and the safety of those around you at risk. When the GCWR is exceeded, the ability to control the load becomes extremely difficult and trying to slow or stop that heavy of a load can be nearly impossible. It is also important to note that the brakes on the tow vehicle are only rated for the GVWR and not the GCWR. Separate trailer brakes should be used if the GCW of the tow vehicle and trailer exceeds the GVWR of the towing vehicle. Exceeding the GCWR can cause many different dangerous issues and can put you and those around you in an unsafe situation. Make sure to know your GCW before you tow! After many years of experiencing the lack of safe towing in our family business, today our family and team have again worked our tails off to provide the world with Towing Peace of Mind. Weigh Safe products will provide you the measurement of tongue weight, which will aid you in your important pre-tow checklist of measurements. Please know before you tow.